Software downloads, user guides, and data sheets. How should I store FREEZEmarker Indicators? To achieve the maximum shelf-life, FREEZEmarker indicators should be stored between 2°C and 8°C. In no circumstance should the FREEZEmarker be stored at temperatures above 30°C. How long does it take a FREEZEmarker to reach endpoint under freezing conditions? FREEZEmarkers are specified to reach endpoint after exposure to temperatures below the specified temperature within a maximum time of 30 minutes. The liquid in the FREEZEmarker’s blister is sensitive to cold temperatures and permanently changes from clear to opaque when exposed to the specified temperature, obscuring the active zone. What does a FREEZEmarker indicator look like? FREEZEmarker is a device used to monitor the temperature exposure of products that must be kept above a specified temperature. It provides an irreversible visual indication of when a freeze-sensitive product has been exposed to temperatures at or below freezing for a specified time, and provides an easy-to-read visual signal when there has been exposure to a freeze event. There are multiple categories available, each with different temperature profiles. What does a HEATmarker H-Series indicator look like? The HEATmarker H-Series indicator is a circle, called the reference surface, with a small inner square, called the active surface, inside of it. The indicator is over-laminated with an orange film, which reduces indicator sensitivity to normal indoor light and gives it an orange appearance, in contrast to the HEATmarker VVMs purple color. What is HEATmarker H Series? 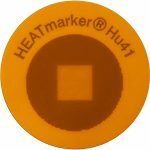 HEATmarker H Series Time-Temperature Indicators are self-adhesive devices that can be applied to any temperature-sensitive product to monitor the temperature exposure over time and provide a visual indication of when the cumulative heat exposure of the product has exceeded a pre-set limit. 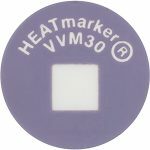 HEATmarker H Series indicators use the same underlying technology as VVMs, but are available with many different time temperature profiles and can be used for products other than vaccines. What is a HEATmarker Vaccine Vial Monitor, or VVM? A VVM is a label containing a heat-sensitive material which is placed on a vaccine vial to register cumulative heat exposure over time. The combined effects of time and temperature cause the inner square of the VVM to darken gradually and irreversibly. The rate of color change increases with temperature. Does a VVM measure vaccine potency? No, the VVM does not measure vaccine potency but it gives information about one of the main factors that affects potency: heat exposure over a period of time. The VVM does not register information about freezing, a factor that may also contribute to vaccine degradation. What does a VVM look like? How does a VVM work? The inner square of the VVM is made of heat-sensitive material that is initially light in color and becomes darker when exposed to heat. The inner square is lighter in color than the outer circle prior to heat exposure, and remains so until the heat exposure reaches a level that surpasses the limits established by the vaccine manufacturer. At the discard point or end point, the inner square is the same color as the outer circle. This indicates that the vial has been exposed to an unacceptable level of heat. The inner square continues to darken as heat exposure continues, until it is much darker than the outer circle. If the inner square becomes as dark as or darker than the outer circle the vial must be discarded. What are the rules for reading a VVM? 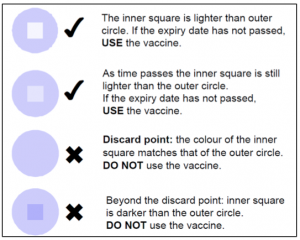 Rule 1: If the inner square is lighter than the outer circle, the vaccine can be used provided that the expiry date has not passed. Rule 2: If the inner square is the same color or darker than the outer circle, the vaccine must not be used. What does a VVM look like as it changes color? Does a VVM immediately change color when exposed to temperatures above 8°C? No. The VVM reflects the heat exposure of the vaccine to which it is attached. It does not undergo an immediate color change in response to brief exposure to moderate heat. Vaccines have a level of heat stability that enables them to withstand temperatures above 8°C outside the cold chain for a limited time. The rate at which a VVM changes color reflects the stability of the vaccine as determined by the manufacturer. If a vaccine is left at room temperature, how long does it take for a VVM to change from start point to end point? This depends on the room temperature and varies greatly with the place, season, time of day and type of vaccine (i.e. VVM category). The table below shows sample times recorded for VVM2 and VVM30. If a vaccine is returned to a refrigerator after being outside the cold chain, will the color change reverse? No. The color change is irreversible. The VVM indicates the accumulated heat to which the vaccine has been subjected. What testing was performed to verify the design of the VVM? Before WHO approved the use of VVMs, all aspects of this technology were subjected to extensive independent laboratory testing and field trials. What quality control procedures are used to ensure that batches of VVM perform correctly? Each batch of VVMs is sampled (according to customized statistical analysis based on the concepts found in ISO 3951-1) and tested with an NIST traceable spectrodensitometer in order to ensure that the VVMs change color as specified in response to heat exposure. What are Inspection Cards and how can I use them? Inspection cards are a tool used by Temptime to assure our customers that VVMs were not exposed to excessive heat during shipping. Temptime affixes a VVM to each card and measures that VVMs optical density prior to shipping. When customers receive the shipment of VVMs, they also measure the optical density of the same VVM affixed to the card. By comparing the optical densities of the VVM prior to shipping and after shipping, customers can tell if the shipment of VVMs was exposed to excessive heat. To measure VVMs, place the VVMs with the release liner still attached onto white card stock, then measure the Optical Density (OD) of the active indicator (I) and reference ring (R) using an X-Rite 500 series spectrodensitometer or equivalent. Measure the reference ring by taking one measurement from the bottom of the ring and a second measurement from another point 90° away. Measure the active indicator by taking two measurements from different points within the active square. To determine optical density difference, also called R-I, subtract the average I value from the average R value. Testing is performed by placing the VVMs in a metalized pouch, immersing the pouch in a circulating water bath at the specified time and temperature, and then measuring the difference between the reference ring and active indicator with a spectrodensitometer, in accordance with WHO’s PQS Specification E006/IN05.3 and E006/IN05.VP.3. Detailed information about Temptime’s release testing is included in the technical information packet that each customer receives. Refer to the Work Instruction entitled P023-C HEATmarker® Vaccine Vial Monitor (VVM) Release Protocol. How should I store VVMs? Prior to being applied to vaccines, VVMs must be stored at temperatures < -24°C and kept away from light and other sources of radiation. Once applied to vaccines, storage conditions are based on the vaccine’s storage requirements. Why do bubbles sometimes appear on the surface of VVM dots? The appearance of bubbles on VVM dots is a known phenomenon that does not affect the performance or interpretation of the indicators. VVM dots are shipped with dry ice to keep them within the specified temperature range during shipping. The bubbles are caused by absorption of carbon dioxide gas from the dry ice into the adhesive of the over-laminate. If the indicator is removed from the extremely cold container with the dry ice and immediately exposed to warm temperatures, the absorbed carbon dioxide escapes rapidly, causing the bubbles. If the carbon dioxide is allowed to dissipate at freezer temperatures, it dissipates more slowly and the bubbles do not occur. The bubbling is only temporary, and the bubbles will dissipate over time when the VVMs are stored under frozen conditions without continuing contact with dry ice. Why do reference rings from different lots of VVMs have different optical densities? Temptime uses batch production techniques to manufacture the color changing active inks that are used in VVMs. Different lots of active ink have slightly different characteristics. To account for this small amount of lot-to-lot variability, Temptime formulates each lot of reference ring ink as a match with its companion active ink. As a result, some lots of VVMs have darker reference rings while others have lighter rings, but they are all formulated to meet the VVM’s specification. Do LIMITmarkers reach endpoint immediately under extreme conditions. It depends. The LIMITmarker F series are temperature threshold indicators that provide a visual signal when there has been a temperature exposure above the specified temperature limit for a specified period of time. LIMITmarker F does not reach endpoint immediately under extreme conditions. The LIMITmarker I series are immediate threshold indicators that provide an easy to read visual signal when there has been a temperature exposure above the temperature limit for more than 15 seconds. What does a LIMITmarker indicator look like? The LIMITmarker F is a blue rectangle with a small white window. When the threshold temperature has been reached for the specified period of time, the white window becomes pink or red. The appearance of any pink or red in the window means that the indicator has reached endpoint. The LIMITmarker I is a dark circle with a small, lightly colored circle inside it. When the LIMITmarker I reaches endpoint, the light area darkens. LIMITmarker is a single-use indicator that provides an easy-to-read, irreversible visual signal when there has been exposure to a temperature above the threshold limit. Why didn’t the indicator on my TransTracker F card reach endpoint after a torture test (i.e. putting the indicator in a fire, in a microwave, in boiling water etc…)? Temptime produces time temperature indicators that are meant to be used under a wide range of storage and/or shipping conditions. Torture tests, such as placing the indicators in a microwave or in a fire, will cause damage and render the indicators inoperable. This type of test does not show how the indicators will function under normal use conditions and cannot be used to determine if the indicators meet their specification. Why didn’t the indicator on my TransTracker F card reach endpoint when I left it out at room temperature? If you leave your TransTracker F card out at room temperature over a short period of time, the indicator may not reach endpoint or show a color change. That’s normal. The pharmacy that shipped the TransTracker F to you has worked with the manufacturer of that medication to determine what time and temperature is appropriate. If you have additional questions please call your pharmacy. What indicators are available on TransTracker? TransTracker is available with one indicator – LIMITmarker indicators, FREEZEmarker indicators, or HEATmarker indicators, or in combinations of LIMITmarker and FREEZEmarker, or LIMITmarker and HEATmarker together on one card. What is the TransTracker shipment indicator? TransTracker is a single-use unit for monitoring temperature during transportation or short-term storage. It consists of one or two temperature monitors affixed to a customizable card, which can be placed inside multiple unit secondary packages or shipping boxes to signal if the response temperature has been reached during transportation or storage.